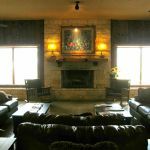 Ask fellow campers about "Texas Wine Country Jellystone Park Camp-Resort" and nearby attractions. Found this nice park at the last minute, it was getting dark so I pulled in. Very nice place! Family oriented so not my best choice as I am a single guy that travels for work, but was very quiet. Nice pull thorough sites. Very well designed and maintained. I only stayed one night and got up early to head out, but was a very nice place. The staff was very informative and friendly! Would highly recommend and stay again! We camped at Texas Wine Country Jellystone Park Camp-Resort in a Motorhome. Great meeting facilities for reunions/rallies. Long level pullthroughs, 20' of grass between sites. Gravel roads and sites. Water pressure and taste was good, no issues w/sewer or electric. Lots of rain led to some standing water. Park staff very responsive to requests. Kids will have fun with jumping pillow & pool/splash pad. Very nice sized dog park. We had room on site 35 to park our 44' 5th wheel, 38' semi truck, and small car with room to spare. $1.50 wash/dry. Deer are prevalent and are likely to be spotted down by the creek at dawn/dusk. I would definitely stay here again if I could get the same rate. We camped at Texas Wine Country Jellystone Park Camp-Resort in a Fifth Wheel. We loved the drive up here. It was so pretty. Not what we were expecting Texas to look like. The park was so much fun for the kids. There was so much for them to do. We went for walks. They played at the playground but I think their most favorite thing was the jumping pillow. They had a small dog area that was clean and had poop bags for you to use. The clubhouse was huge and had TVs, magazines, and movies to rent. Laundry and RR were nice. Laundry was about $1.50 for wash and the same for dry. We camped at Texas Wine Country Jellystone Park Camp-Resort in a Travel Trailer. We loved all the wineries around. We went into town and had pizza at a local restaurant there. The little boys loved the fresh pizza. I loved walking around and seeing all the shops full of local artists. We really loved this town. Very nice park. We were concerned that there may be a lot of noise from the youngsters, but found it very quiet and laid back, since we were there mid-week after school started. Nice long pull through spaces and the staff was busy keeping it maintained. We were able to get satellite from this site, although there are some large trees nearby. We camped at Texas Wine Country Jellystone Park Camp-Resort in a Motorhome. You couldn't be closer to all the wineries in the area, as they are right across the street and nearby. The town of Fredericksburg, however, was about a ten mile drive. Lots to see in the area, with over 40 wineries, and Luckenbach dance hall nearby. Luckenbach is about 5 miles away. Their 5 o clock acoustic groups meet under the large oak tree and you can check the schedule online. This is a great family campground. We camped with 2 kids ages 8 and 10 and we had a great experience. Our kids loved the pool, jumping pillow and basketball court immensely. The campground has a great vibe and is quiet and clean. They are also constructing a ton of new sites so when they are finished it is going to be so much better. We drove by other campgrounds in the area and are so glad we chose to stay here. We highly recommend this campground for family travelers! We camped at Texas Wine Country Jellystone Park Camp-Resort in a Fifth Wheel. Of course Enchanted Rock hike! Nothing here worth such a high cost. Pool area nice but in mid October too cool to use. Hot tub didn't work. Weak WiFi. Only 30% of park is constructed and open as of our stay. Nearest restroom and shower a 3-4 minute walk. No shade on hot side of RV. Nice dog park but clear on other side of park. Nothing special about this park. Would not stay here again. We camped at Texas Wine Country Jellystone Park Camp-Resort in a Motorhome. Electric & Sewer good, Water @ 50psi. Wi-Fi was ok but not real strong. AT&T Cell Phone signal was weak but usable. Verizon 4G LTE Air Card was very good. Cable is available. Sites are good and mainly level with plenty of room between. Roads and sites are mainly dirt with light pea gravel. Restrooms very good. Clean and in good condition. Laundry was a bit cramped but I didn't use it. Few long term tenants. DirecTV Satellite worked well. Nothing to block the access even with the few trees. Payment was made with credit card. The management was nice and friendly. Dumpsters were sometimes hard to get to. Roads were dusty when entering and leaving. I would stay here again when in the area. We camped at Texas Wine Country Jellystone Park Camp-Resort in a Fifth Wheel. Many wine tasting places around. Luckenbach TX is an interesting place and you can listen to some good bands. This was our first stay here. We stayed here as this is where our event (2016 Texas Sweetheart Rally) was being held. We stayed in site 34 which is a buddy site and it was great! All the sites were 25 to 30 feet in width. All sites were nice and deep (60 to 75 feet or so). We used their Mocking Bird Hall for our event. The room worked well for us, albeit a but loud (need more sound baffling). We used the kitchen in the hall and it was great and real handy for us. The restrooms between halls was modern and very clean. I never went into it, but I was told the bath house was very nice. I got to go into a cabin/cottage as a friend was checking one out for a possible stay. The units were very spacious, well stocked with everything you'd need except food and clothing. They were very clean as well. I bit $$ at $160 to $180 per night or so, but divided by the number of people they can sleep - not bad I guess. The office has a very large and very well stocked camp store and the staff was very friendly and very accommodating to our group. While this CG is 10 miles east of Fredericksburg, it was no big deal at all to go into town. We'd stay here again! We camped at Texas Wine Country Jellystone Park Camp-Resort in a Fifth Wheel. This is a buddy site with the one on the end. It's a great site. Beautiful and tranquil setting. Perfectly situated in wine country with a short drive to Fredericksburg. The park was super clean with tons of amenities. Very friendly staff. Looking forward to our next visit. We camped at Texas Wine Country Jellystone Park Camp-Resort in a Motorhome. A little pricey but worth the trip. Very family friendly and well-maintained. Will likely go again next time we go to Fredericksburg. We camped at Texas Wine Country Jellystone Park Camp-Resort in a Travel Trailer. Great location near to many wineries and not to far from the main part of town. Overall I would say it was quite pricey for what you get. The sites are not very private and do not have any trees for shade. The kids enjoyed the tractor ride but overall not impressed for the cost. We camped at Texas Wine Country Jellystone Park Camp-Resort in a Travel Trailer. The reason for a 5 is this park is totally overcharging, unless you have kids and don't mind paying for stuff like Boo Boo Bears BD Party for the kids to do. It should be $25 or less. Sites and roads are gravel. Area around the site has NO grass (weeds) and some stickers if you have pets. This rate was for a back-in site. Pull thru's are almost $10 higher!! Friendly counter people. Tourist trap "Ranger Station" they call their office. Laundromat was being used by the staff to wash sheets and linens from the cabins (they left one washer for us). We would not come back again at this price. Fredericksberg (which we came to see) is over 8 miles west of the park, so not handy if you want to eat out often. We camped at Texas Wine Country Jellystone Park Camp-Resort in a Motorhome. This was a return trip for us prior to Christmas. Initially we really like this campground because they do have some really good amenities like nice clubhouse, pool tables, and bathhouse. There is a lot to do here. However my opinion changed this trip. This trip is was about the sites. It had rained, and lots of dew in the mornings made for sites that are muddy. For $75 bucks a night, I'd expect to at least have a paved pad and patio, and paved roads. The crushed granite just spread on the ground did not cut it for us, especially when you have dogs. That sure made a mess of our rig. Voltage was erratic, but maybe that was because it was also 25 degrees one night? It peaked at 132V at one point( knocked out our TV and haven't gotten the bill for that yet). We requested to use the hot tub one afternoon for the evening, but by the time it got hot enough to get in, they had already locked the gate. It's like they didn't want us to go use it. I'm sorry that the $300 bucks we spent there was an inconvenience. And to top it off, they charge an extra $10 per night for the "holiday rate". It wasn't like they were full or anything. My opinion now is that there are other places in the area just as good and for 1/2 the price. I doubt we will be back. Price / value was way off the mark this time. We camped at Texas Wine Country Jellystone Park Camp-Resort in a Travel Trailer. This is a relatively new campground; so, the shade trees and some of the landscaping have not yet matured. The guest lounge and and all public buildings were spotless. The games in the arcade were free during our visit - our kids loved that! The owners are very nice and went out of their way to make sure we were comfortable and properly set-up. The pool and hot tub were excellent, as well. Would definitely stay here again. 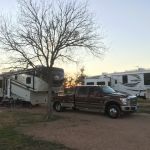 We camped at Texas Wine Country Jellystone Park Camp-Resort in a Fifth Wheel. 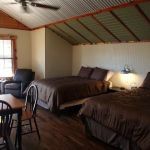 Are you affiliated with Texas Wine Country Jellystone Park Camp-Resort ?